One person company is the concept introduced in companies Act 2013. 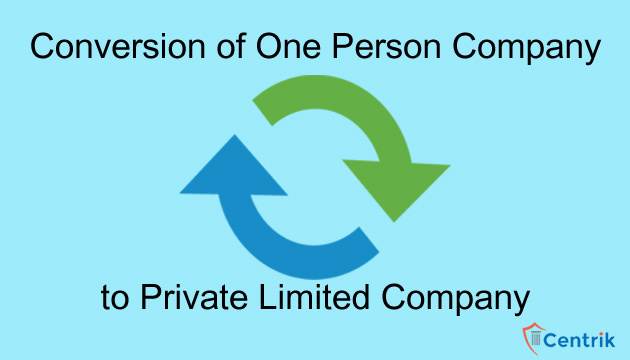 One Person Company (OPC) is similar to private limited company with some differences. One of the major difference is that OPC can be run with just one member in place of two members required in private limited company. OPC can later be converted in to private Limited after two years of operation, or even before that if its turnover is more than Rs 2 crore and paid share capital exceeds 50 lakhs in a financial year. There may be two scenarios while converting OPC in to Private Limited Company. Here we are describing both cases with their procedure. When an OPC has paid up share capital that exceeds Rs.50 lakhs and the annual turnover is above Rs.2 crores, then it is obligatory for them to convert into a private limited company. During the conversion, the members have to just pass a special resolution in the general meeting. Within sixty days of the passing of the resolution, company needs to file form INC-5 , (an application to the registrar along with a copy of the resolution) and If the ROC found all documents in order, it will issues the certificate of conversion. Hold Board meeting to consider for increase in directors, shareholders and modification of MOA and AOA. Hold General meeting to pass special resolution. File Form MGT-14 within 30 days of passing special resolution with ROC. File form INC-5 informing that it has ceased to be a One Person company and now required to convert itself into a private company. File form INC-6 within 6 months from the date when the threshold limit as mentioned above exceeded. If ROC found all documents in order, it will issue certificate of conversion. The procedure of voluntary conversion of an OPC into a private limited company falls under the section 18 of the Companies Act 2013. Once an OPC is incorporated, the conversion cannot happen before two years . An application in form INC-6 to be file to ROC and the registrar has the power to issue a certificate of conversion. After the conversion is done, it is obligatory for a private limited company to have a paid up share capital of Rs. 50 lakh and also an annual turnover should not be less than 2 crores, failing which, it can convert back to an OPC by passing of a special resolution. File form INC-6 within 30 days of passing special resolution with ROC. If ROC finds all documents in order, it will issue certificate of conversion. Conclusion– After reading this article, you can conclude that for conversion of OPC in to private limited company, the said company must have paid up share capital exceeds Rs 50 Lakhs and turnover exceeds Rs 2 crore.